Sagitally sectioned to display the external and internal details at the same time, the life-size model beautifully details the surface musculature, veins, arteries, and nerves on the right side, and the details of the brain and associated structures such as the ventricles, brain stem, medulla, and more on the left. 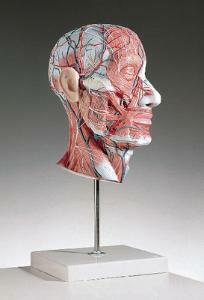 The model also shows a sectioned vertebral column and nerve cord, tongue, sinus cavities, esophagus, and larynx. It is mounted on a stand and can be removed for closer examination.